Brain Bee Team from left: Pavel Juranek (Coordinator, Business School), Vilma Pullinen (Team Leader for School Engagement, Psychology), Zuzana Suchomelova (Team Leader for Fundraising, Psychology), Malwina Filipczuk (Volunteer, Psychology), Simona Dulajova (Volunteer, Biomedical Sciences), Ludmila Kucikova (Coordinator, Psychology), Jonas Kjaersgaard (Volunteer, Psychology). Other volunteers: Patrycja Domeradzka (Psychology), Layla Shaheen (Medical Sciences), Jasmine Paneva (Psychology). 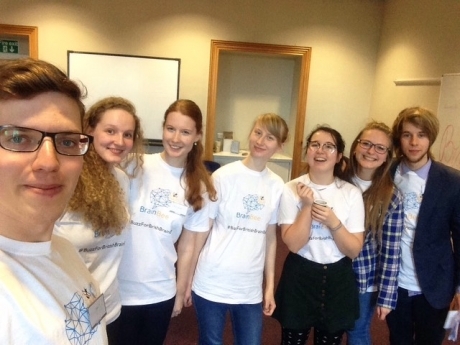 A group of second and third year undergraduate Psychology students organised a local Brain Bee event in Aberdeen in February 2018, coordinated and managed by Ludmila Kucikova (year 3). Students from the Business School and Medical/Biomedical Sciences also volunteered. The Brain Bee aims to motivate 14-18 year olds to learn more about the human brain and inspire them to consider a career in neuroscience or neuropsychology. It is styled similar to a Spelling Bee, with the competition at a local, national, and international level. Two of our students visited local secondary schools where they gave a presentation on Biological Psychology and Neuroscience to 14-18 year olds and promoted the competition. They held a Question and Answer session afterwards and teacher feedback was very positive. At the Aberdeen Science Centre, a group of around 10 school pupils took part in the Brain Bee competition in which they had to answer questions on Neuroscience and complete a series of practical challenges, such as patient diagnosis and labelling brain anatomy. The top three pupils were selected and they will take part in the National Level Brain Bee competition in Nottingham. The event was supported by Professor Louise Phillips from the School of Psychology, Dr Guy Bewick and Dr Steven Tucker from the Institute of Medical Sciences, Dr Ann Rajnicek, and Dr Matteo Santoro from the Aberdeen Neuroscience group.